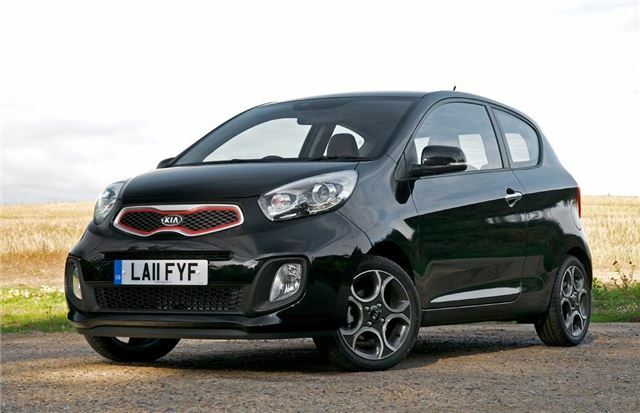 Kia will launch the three-door version of the Picanto on the 1 September with prices starting at just £7795 on the road. It's the first time there has been a three-door Picanto - the previous model was five-door only - and Kia says it has a more sporty character than the standard Picanto with a different grille, unique alloy wheels and restyled bumpers. The dimensions of the three and five-door Picanto are identical but there are some key differences that make the three-door model stand out - aside from the obvious absence of rear doors. The grille opening is larger than that on the five-door and is available with silver or red trim. The front bumper has been reprofiled to make the car appear wider and lower. It contains a slim, full-width lower grille, housing large black-bezelled foglamps with the two upper trim grades. The rear bumper has a rectangular black central section in place of body colour, designed to make the three-door Picanto look appear sportier. There are also twin chromed exhaust outlets in place of the hidden single tailpipe of the five-door car. The three-door Picanto is the same 3.6 metres in length as the five-door and to make access easy it has sliding and tilting front seats to create a wide ‘walk-in’ to the split rear bench. The latest Picanto gets its own colour schemes and trim levels, to reinforce the idea that this is the sportier model. The entry-level version – badged Picanto 1 (or with air conditioning - Picanto 1 Air), comes with all-black upholstery. Above that, the models are called Halo and Equinox rather than 2 and 3. Halo has premium black and grey interior trim, while Equinox is finished in premium Chilli red. Depending on engine and trim combination, there is a choice of four exterior colours, and alloy wheels are standard on all but ‘1’ and ‘1 Air’ grade cars. Standard features on all versions include a trip computer, a height-adjustable seat and a tilt-adjustable steering while inside there's an RDS radio and CD player. Halo and Equinox modelso have USB and AUX ports, an iPod cable and steering wheel-mounted audio controls while on the outside body-coloured mirrors and bumpers and twin chromed exhaust are all standard. While the Halo and Equinox versions have differing equipment levels they share certain items such as Bluetooth, automatic lights, LED front daytime running lights, body-coloured side sill mouldings and a red front grille surround. The Halo version adds to this with unique 14-inch alloys, heated front seats, heated steering wheel, reverse parking sensors, alloy pedals and a Supervision Cluster – Kia’s comprehensive electronic instrument binnacle. The Equinox trim changes the interior to premium red ‘Chilli’ upholstery with a contrasting high gloss black fascia and gearknob. Distinctive 15-inch telephone-dial style alloy wheels lend a more sporting look to the exterior which is finished in Galaxy Black metallic paint. Automatic air conditioning and a smart key with a start/stop button are on top of the shared level of specification. Engines are the same 1.0-litre and 1.25-litre petrols from the five-door, with official fuel economy of up to 67.3mpg with CO2 emissions at 99g/km. The larger engine is available with Kia’s EcoDynamics fuel-saving technology – an Intelligent Stop & Go engine stop/start system – or with automatic transmission. The three-cylinder 1.0-litre unit develops 68bhp and 95Nm of torque. The 1.25-litre four-cylinder engine is offered in three guises, all developing 84bhp and 121Nm of torque. In standard form it averages an official 60.1mpg. With a four-speed automatic transmission fuel consumption is an impressive 53.3mpg. Finally, there is the EcoDynamics version with fuel consumption at 65.7mpg. The Picanto, in line with every other Kia, comes with aseven years or 100,000 miles on all non-wear and tear parts, including labour, subject to terms and conditions. The warranty is fully transferable to the next owner if the car is sold before the time or mileage limit expires.